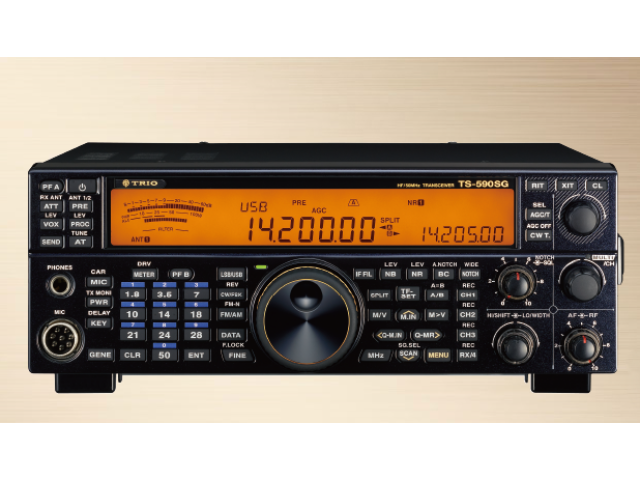 Anniversary edition of TS-590SG Trio Badged JVC Kenwood Co. TS-590SG 70 DESPOSIT PAYMENT ONLY Anniversary edition of TS-590SG Trio Badged JVC Kenwood Co., Ltd. will release 70 special limited HF / 50 MHz transceiver TS-590SG 70 with a TRIO logo as a model commemorating the 70th anniversary of Kenwood establishment from mid-September. The price is to be announced. EU/US Dillers will be receiving very limited quantity so they will be available on a strictly first come first serve basis with a deposit of 130 USD The Kenwood brand that has been popular with amateur radio operators for many years . Last year, to commemorate their 70th anniversary they introduced a special TS-590SG 70 which will have the TRIO logo on the front panel. Trio was the predecessor of the KENWOOD brand. The limited model has a luxurious elegant crystal black finish, and it is envisaged that 70 limited serial numbers will be released, as well as giving Kenwood’s 70th anniversary commemorative call sign plate as purchaser benefit. Provisional Specification Enhanced RX performance accomplished superb 3rd Order Dynamic Range @ practical 2 kHz separation. CW Decoder CW signal is decoded and scrolls in the 13-segment section of the LCD (similar to K3). (Decode performance may be affected by noisy/weak signals) MULTI/CH SW MULTI/CH encoder is changed. Now with push-switch function. This switch works as Programmable Function C You can assign a PF function to it such as Key speed, Power, MIC etc. *Click numbers 24 to 20 ANT OUT It’s possible to use DRV OUT terminal as ANT OUT.This terminal provides divided antenna output via internal power splitter. So easy to connect external RX such as a Pan-adapter. *Exclusive with DRV OUT. *3dB loss in divider. Split Frequency Setting – Find DX with split operation. Push and hold SPLIT key. Push “2” key for example.Then you can work 2kHz up in Split Operation. TX Power Spike – TX power spike comparable to TS-990. 2 kHz Dynamic Range Revised circuitry around 1st Mixer improves C/N characteristic of 1st Local OSC Exterior enhancements Increased LCD back light colour selections from two to tri-colouur (AMBER | GREEN | YELLOW) in 10 steps.